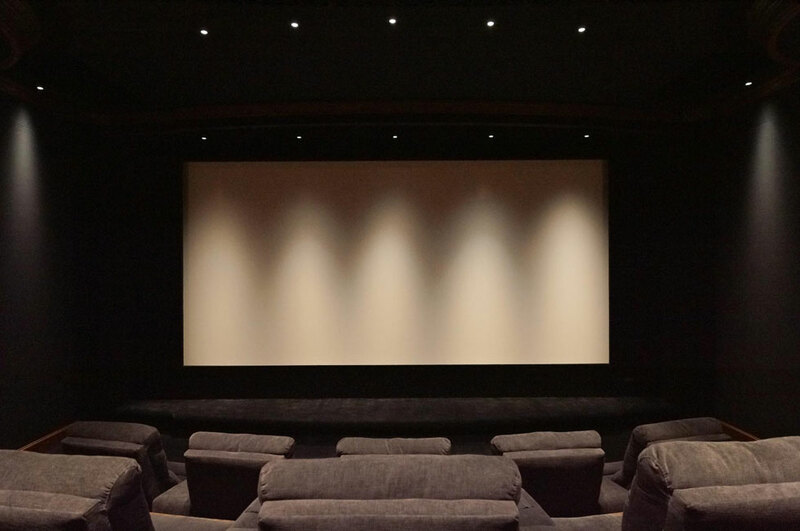 "Home Theater of the Month: The Hahn Theater"
As a retired cinematographer, Rob Hahn knows a good-looking image when he sees one. So it’s no surprise that he wanted a superlative home theater. 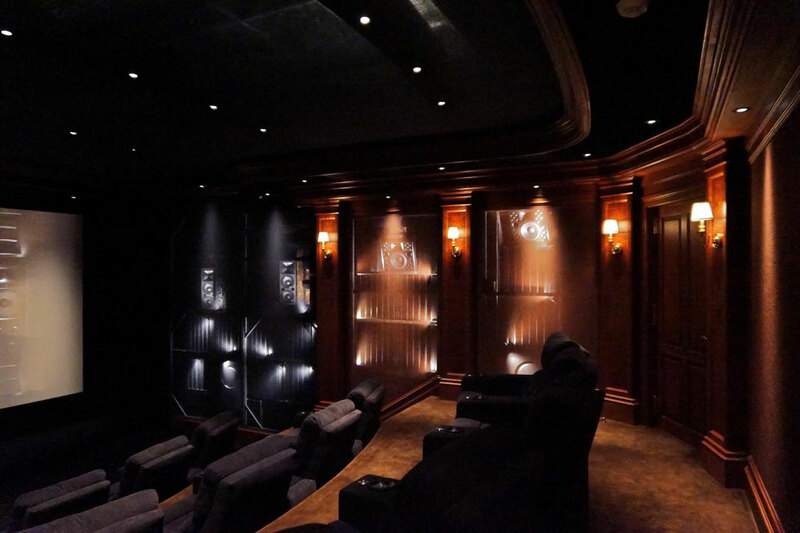 “I’ve always dreamed of building a proper home theater, but it’s only just now that the technology is good enough to do it right.” Also, he was frustrated whenever he went out to the movies. “I got tired of seeing films out of focus with dim lamps and painfully loud sound levels. Rob’s guests enter the huge theater from one of two airlocks in the rear. 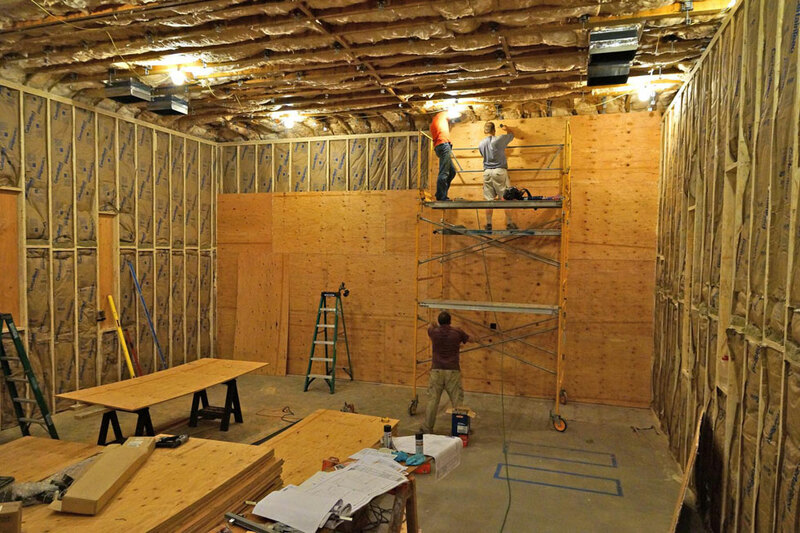 Rob’s theater started life with basic framing. 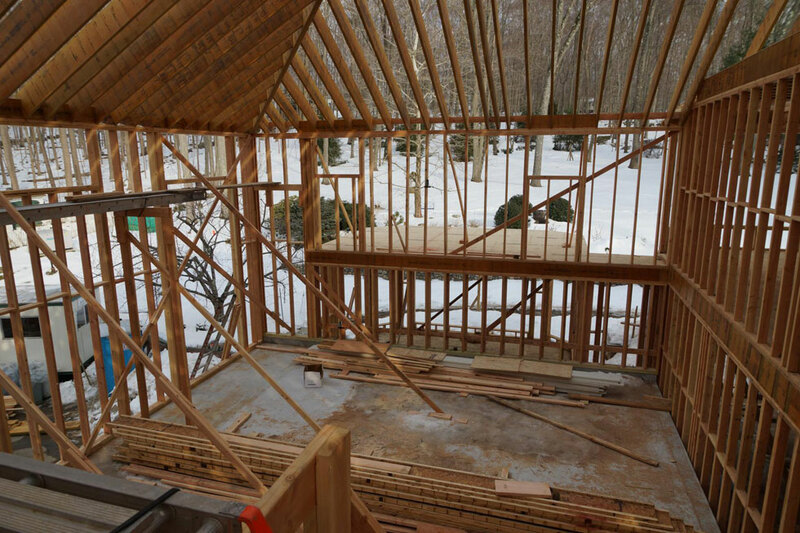 The pitched roof would become an attic space for HVAC conduit, cabling, etc. Looking toward the front of the theater as the plywood walls are being installed over the framing and insulation, you can see how enormous it is. That design was very specific. “I wanted a theater that presented movies as an all-encompassing experience without having to build a bat cave. A completely black room can feel oppressive, so we built a hybrid. The back half of the room has warm wood, deep-brown carpet, and classic moldings, while the front half is black to maximize perceived contrast on the screen. In terms of shape, I hate shoebox theaters, so it was important that the room got wider as you got closer to the screen. “Also, 4-way masking is extremely important to me. I wanted to be able to make 1.33 films larger than they would be in a constant-image-height [CIH] setup. You watch Close Encounters in 2.35 and Gone With the Wind in 1.33. In CIH theaters, to get the 1.33 aspect ratio, you would bring in the side masks, creating a smaller canvas. But with 4-way masking, I can move the top and bottom masks—as well as the sides—to create 1.33, but I end up with a larger canvas than I would have in a CIH configuration. I believe that Gone With the Wind was meant to have just as much impact as 2001, and the only way to achieve that is with 4-way masking. 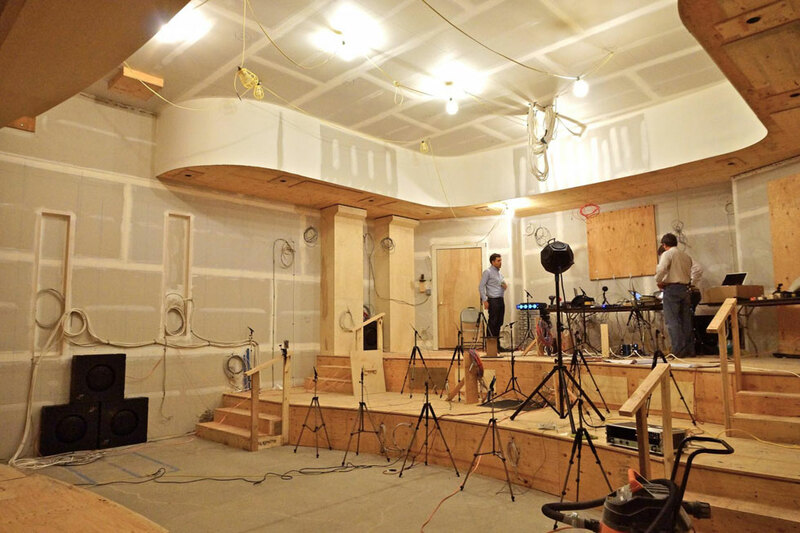 KYD’s acoustical engineers modeled and simulated the room’s acoustic performance during the design phase, and when the construction got to a certain point, they measured the acoustics with high-resolution conventional microphones and a 3D mic to see how closely the actual space matched the computer model. If it didn’t, they could tweak the space as needed. The room’s noise floor was another important consideration. “I wanted an intensely quiet room, and the design of the HVAC [heating, ventilation, and air conditioning] system was crucial in this regard. The goal was a noise rating of NCB 5 [which is quieter than a professional recording studio], and Keith’s engineering team builds a 6 dB ‘pad’ into the calculations to offset field discrepancies, which means the results equated to NCB -1 [negative 1]. 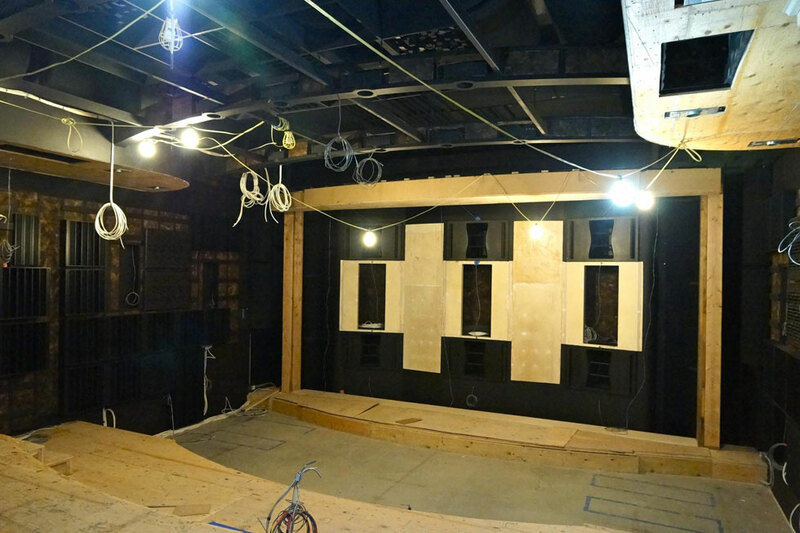 Another noise-reducing strategy was to build an entirely separate projection booth/equipment room, which is acoustically isolated from the main theater. 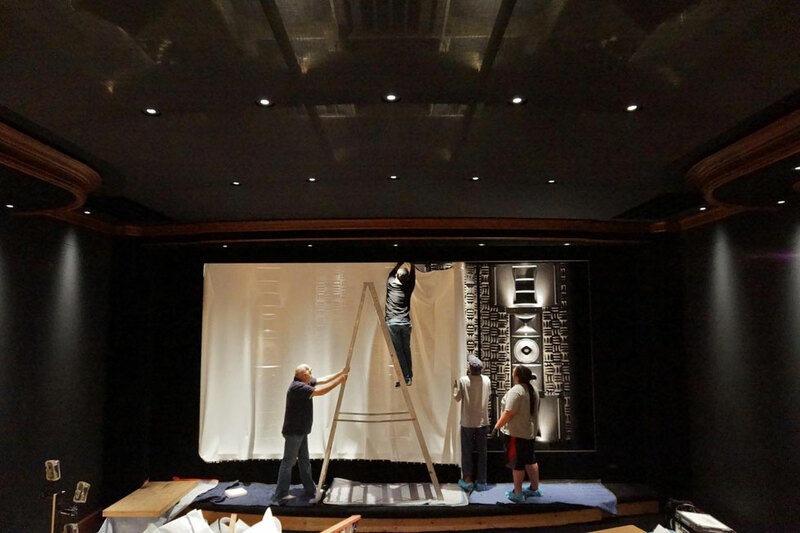 The front LCR speakers—JBL’s mighty M2s, no less—are mounted behind a 19-foot-wide, microperfed Stewart SnoMatte 100 acoustically transparent screen. 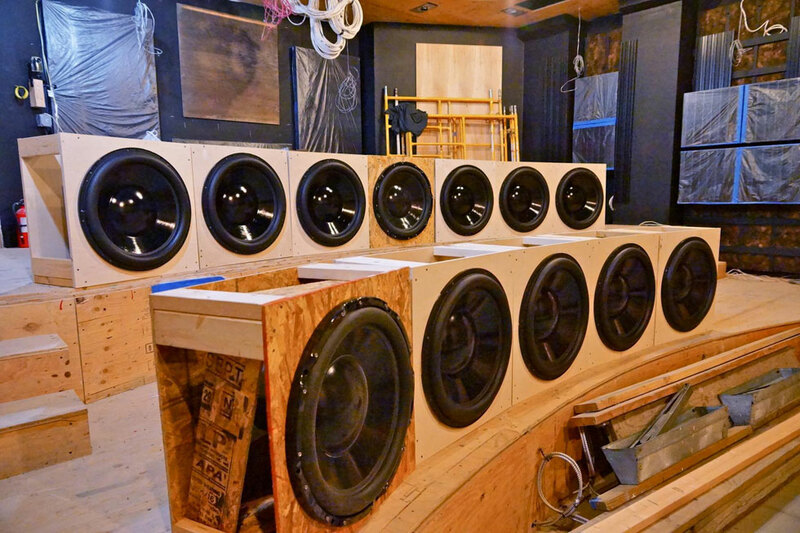 Joining them are six KYD-designed UberSub infrasonic subwoofers, each comprised of dual 24″ drivers facing each other in custom-machined housings; that’s 12 drivers in all. As verified during four days of testing and system calibration, the UberSub system met its target of reproducing bass down to 5 Hz at 120-130 dB with less than 3% total harmonic distortion. The front baffle wall includes spots for three JBL M2 speakers, each with an UberSub above and another below. These 12 24″ driver units are destined to be mounted in pairs above and below the front LCRs. 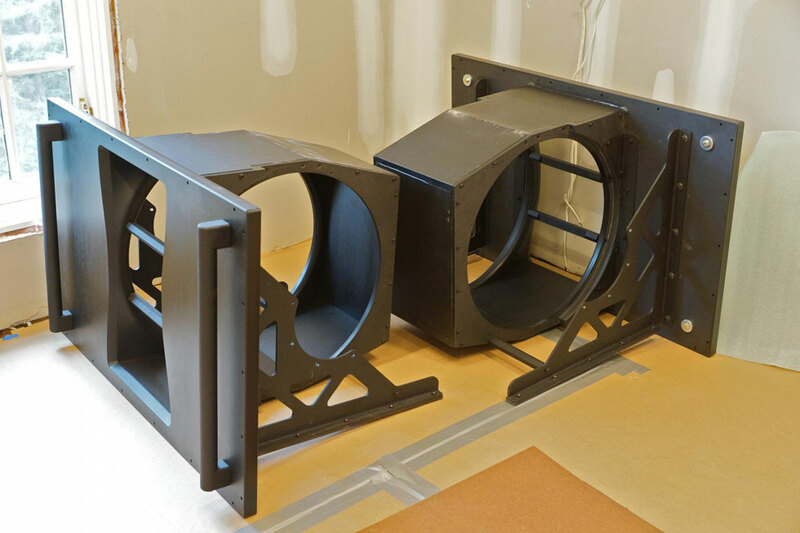 Two UberSub driver units are mounted facing each other in each of these custom, force-cancelling housings. On the forward portions of the side walls are two JBL AC28/26 speakers on each side, serving as front-wide channels. 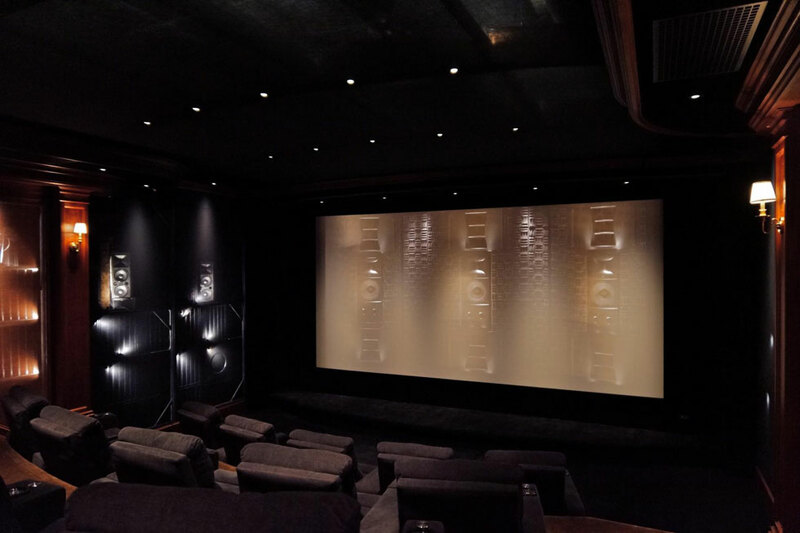 The surround duties are performed by six JBL 8340As (two on each side and two in the rear), and 10 JBL SCS 8 speakers are mounted on the ceiling for Atmos overhead effects. Rounding out the speakers are eight KYD/JL Audio SHOC-24 subwoofers at the side and rear walls and two more 24″ infrasonic subwoofers mounted under the center seat in the second and third rows. In terms of the number of speakers, the Atmos configuration is an amazing 13.16.10. 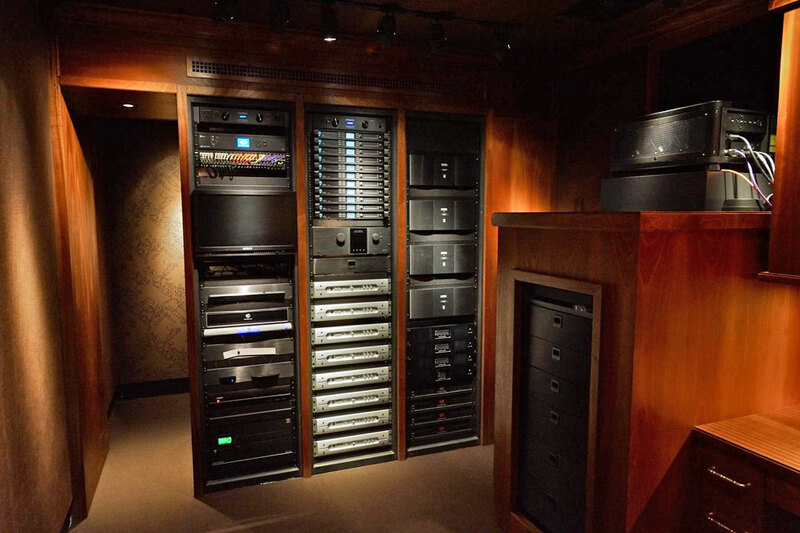 Clearly, nothing but a Trinnov Altitude32 pre/pro would suffice to control such a monstrous Atmos system! 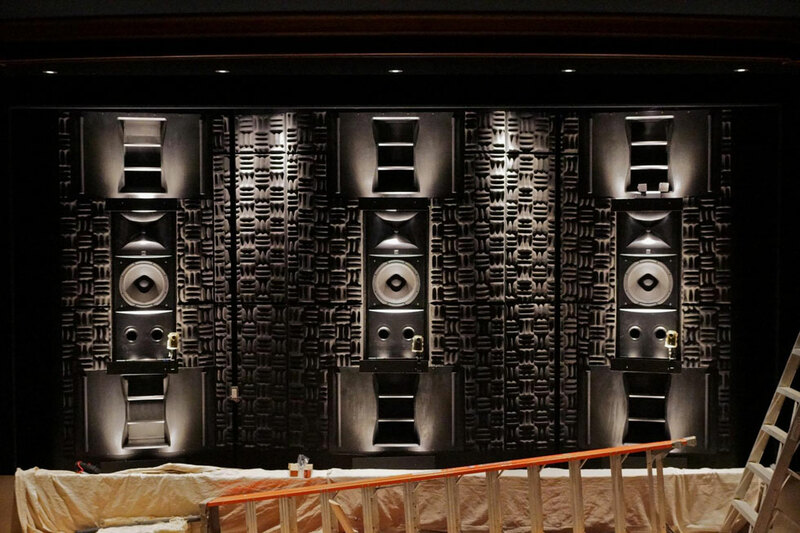 Here you can see the face of the 30-inch-deep front baffle wall, including three JBL M2s and a total of six UberSubs above and below the main speakers, all surrounded by acoustic foam. Installing a screen this large is not trivial. Under regular lighting, the screen looks completely normal. With the lights on behind the acoustically transparent screen, you can see the speakers through the perforated material. With normal illumination, the side looks like a solid wall. The side walls are actually acoustically transparent fabric, behind which are the surround speakers and acoustic treatments, which you can see when the inner lights are on. 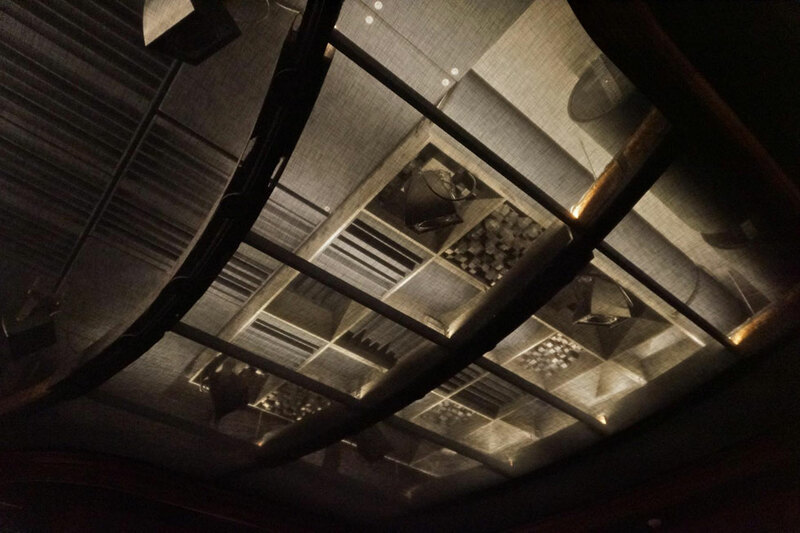 Likewise, the ceiling is acoustically transparent fabric, and the overhead Atmos speakers and acoustic treatments are visible when Rob’s special lighting is on. The seating includes three rows of five Palliser Vox recliners each. 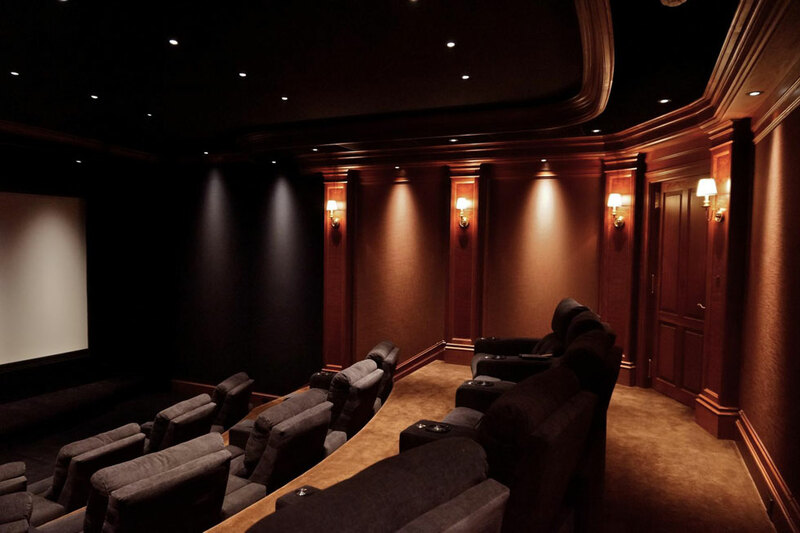 While the back of the room is done up in warm wood and brown tones, the front is black, maximizing perceived contrast when watching a movie. A moving movie-watching experience, indeed. 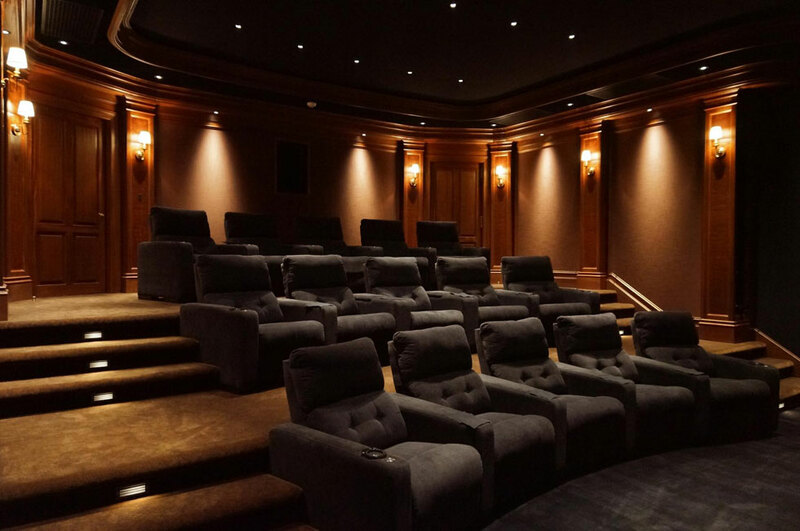 Now, after all the hard work—and a bittersweet farewell to one of those who made it happen—Rob and his family and friends get to enjoy one of the most sophisticated home theaters I’ve ever come across. 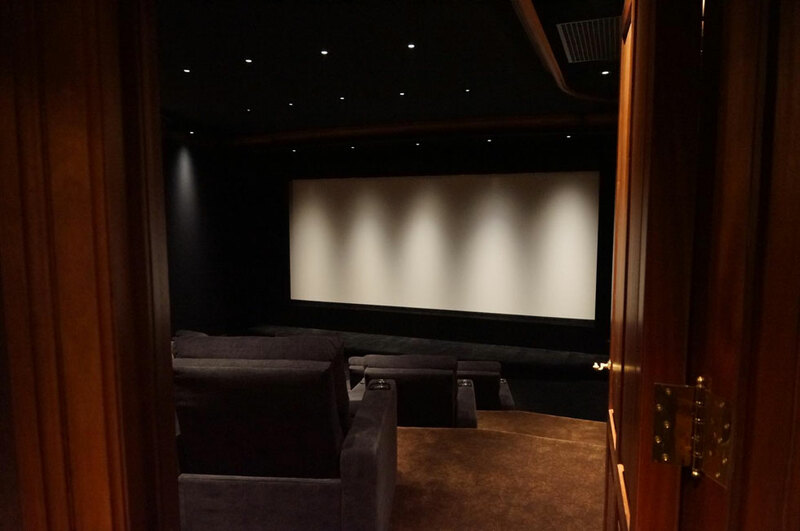 For much more detail about how Rob’s home theater came together, check out the build thread here. Also, fellow AVS member Art Sonneborn, who owns one of the theaters Rob visited in 2008, recounts his visit to Rob’s theater here. 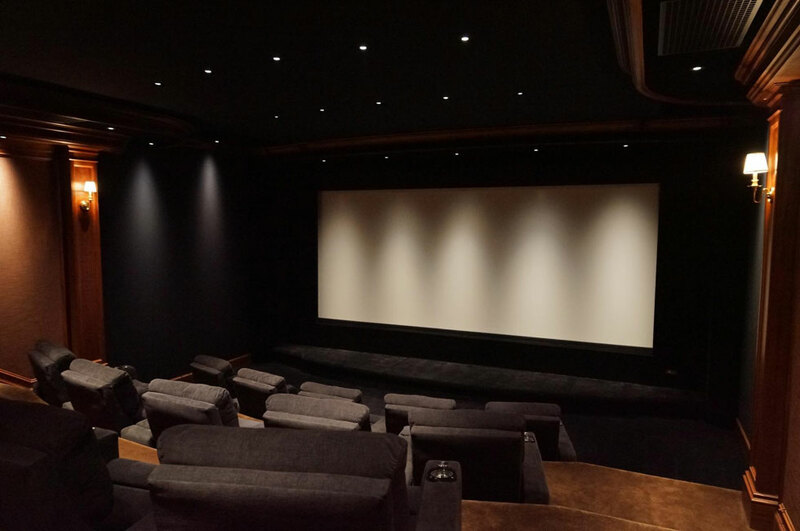 If you’d like your home theater considered for Home Theater of the Month, PM me with the details and a link to your build thread if available.